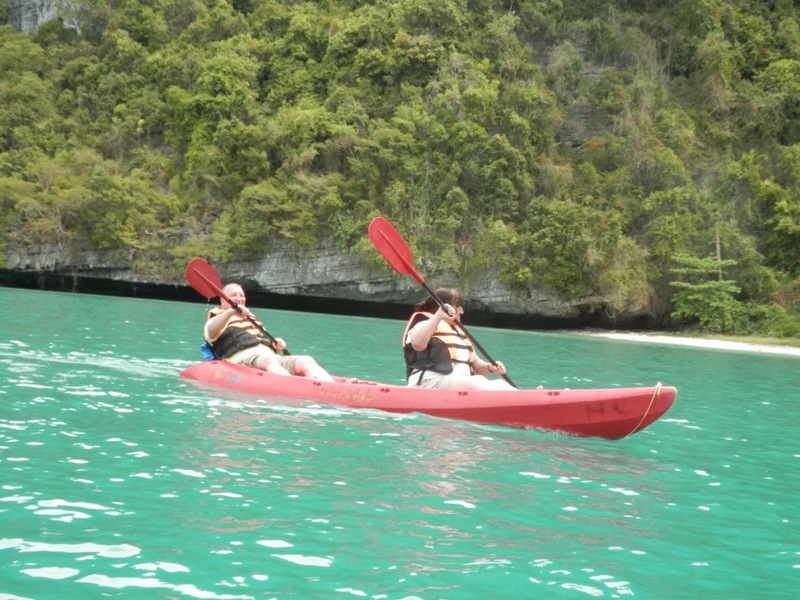 Highlights: Ang Thong National Marine Park, Kayaking in the Gulf of Thailand. A major seafaring day, not for those with motion sickness for sure. We checked out early from the hotel and had our bags locked away, we would see them late in the afternoon for our ferry ride to Koh Phangan. We all squeezed into one van for the first time and left around 7.15 am for the cruise around the Ang Thong National Marine Park. Catherine wasn’t feeling the best on the boat so both she and Maria decided to do land based activities. Sophie found a great corner of the boat to take in the coast and we were off on the high seas. First stop was for swimming, hiking and relaxing. Just before we climbed into the smaller boat to take us ashore I recalled my flip flops were back in my backpack at the hotel! Never minding I got on shore with out wrecking my hiking boats and quickly headed into the ocean. Having Cat watch out day packs / items makes it easier to enjoy and explore the island. Rob and myself headed up one of the hills that helpfully had a rope for the climb. It did occur to me one slope and my trip could easily be over but thankfully no problems one this occasion. After a few hours onshore it was back to the boat for lunch. I could tell at this point sunburn was a real possibility today. One the way to the second stop off point the kayaking option was explained which was accepted by most of the group. This time my valuables were put into a personal waterproof bag to take with me. The day pack stayed on board. We got around most other obstacles fairly well and at the half way point have for the last part got in sync with each other. A relaxing swim at the half way point was needed. The first half proved taxing and it was only at this point we realised we had probably put too much into each stroke I.e. it’s better to try to glide then always push the kayak. The highlight of the day however was when the local guide got our kayak to go into a dark cave, so dark that at one point I couldn’t see anything and had to guess what way to go! The cave then opened up and in the roof we had the sun shine in. At this point we looked at the exit, the guide said one of us had to jump out and help us swim out, the opening was tiny. Lydia lead the way and both myself and Sarah laid back as far as possible and then pushed against the roof and get out. We had to push the kayak so far down that we got water in the boat we our noises against the rocks. A little scary but ultimately awesome experience. Lydia and Sarah both got a free beer for their efforts but I missed out, sexism at work I think! After landing and high-fiving each other it was time for a quick hike up to see at lagoon at our three and final island. The stairs were more like a ladder, hard to see out the even build such a structure. The lagoon looked appealing but time was running out and since you weren’t allowed to swim in it I decided it wasn’t worth the hike down. Now the climb back down was however eye opening to say the least. Back down at the beach all our stories from kayaking started up again. It turned out Kirsty and Laurence went into the same caves but missed out on the free beers. They did it without a swimmer pulling the kayak so very impressive. I don’t think anyone else did the caves. Once back on the ferry we did a cruise via a lot of the other smaller islands and after and hour or so we headed back. At this point I was actively staying out of the sun, sunburn is almost certain. The cruise and the kayaking was awesome. It’s great when you have a day like today. On our return to land we welcome our bags back and then caught another ferry, this time public, to Koh Phangan which took about an hour. I helped by passing all of our bags to the pier since it was hard to walk down with them. We then loaded ourselves on to the back of a truck for our hair raising ride to the resort. No seat belts and little visibility on questionable roads via remote forests. The resort however seems like a paradise with my room just metres from the sea. No wifi, restricted air conditioning, with the best way out by boat this is remote. This is home for the next few days.